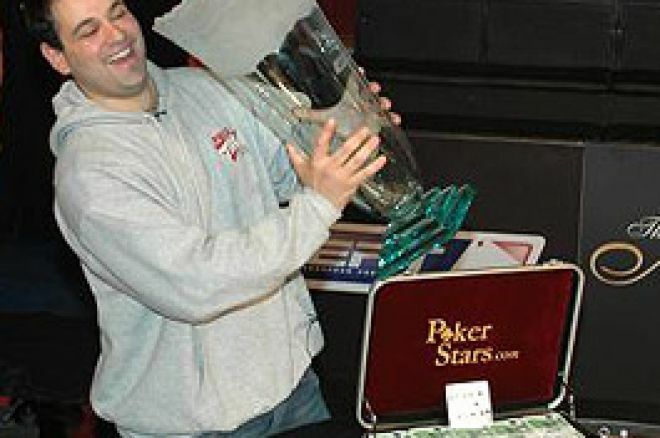 Roland De Wolfe, one of UK poker's top professionals, has won the Dublin leg of Season 3 of the European Poker Tour, cementing his place in the top ranks even further. Our Irish correspondent, and poker pro himself, Nicky O'Donnell, was there to record the best moments and concludes his series of reports. William Thorssen's weakness as a strong finisher in tournaments was evident from the start as he lost 180,000 of his 770,000 stack on what had to have been a complete bluff after a post flop check raise. When David Tavernier then moved all in, Thorssen folded immediately even though he looked pot committed. Roland De Wolfe took the first dent to his stack when he raised from the cut-off to 40,000 with Queens and Rob Yong moved all in from the small blind to 240,000 with A-K and was called. Yong won the race by hitting a King on the turn. Nick Slade exited in 7th place when he picked the wrong time to make a move against the chip leader. With blinds now 8,000/16,000 with a 2,000 ante, there were three limpers into De Wolfe's big blind who raised to 100,000. It was folded back to Slade who pushed all in for 220,000 more and was immediately called. J-9 for Slade. A-Q for De Wolfe. The flop came A-Q-9. No miracle 2-outer for Slade who wins €70,210 for his efforts. Rob Young who was one of the limpers in this hand had been contemplating making the same move as Nick but passed a pair of Fours which would have hit a set on the turn!. Gavin Simms doubled through De Wolfe when he pushed from the small blind with A-Q. De Wolfe in the big blind called with J-T. Flop came K-7-2. A Jack came on the turn giving Roland a pair but Simms rivered a Queen to stay alive. Home favourite, 72 year old George McKeever (who looks remarkably like Santa Claus only without the beard) then doubled up through Rob Yong with A-K vs Q-Q all in preflop. King on the flop. Roland De Wolfe seemed to be getting the better of the early exchanges with his biggest rival Thorssen. They both saw a flop which came Jc-Jd-3s. Check, Check. Turn was 6h. Roland checks, William bets 45,000, Roland makes it 165,000 and William calls. River was the 3c. Both check and Roland announces full house, showing a 3 in the process. Then there was another scoop for Roland. Flop = 2s-As-3c. Roland bets 70k, William Thorssen calls. Turn is Qc. Thorsson checks, Roland bets 140k, Thorssen calls. River = 8s. Thorssen checks and Roland asks his opponent how many chips he has. "670,000," replies Thorssen. Roland bets 350,000. Thorssen shakes his head and folds. Rob Yong then raised one off the cut-off, Roland announces all-in from the big blind, Rob insta-calls. Ad-Jc for De Wolfe, Ac-Kd for Rob. The Board comes Ah-2h-6h-7s. The river was the Jack of diamonds meaning Rob Yong is "3-outered" and eliminated in 6th place winning €88,690. With blinds 15,000/30,000 just after the dinner break, George McKeever moved all-in under the gun 5-handed, Roland De Wolfe asked for a count (it was 227,000) then calls! George had KsQc, Roland had pocket 8s. George's hand doesn't improve and the last remaining Irishman is finally taken down but wins €112,710 in the process. Once McKeever was out of the event the atmosphere became remarkably subdued as the Irish crowd lost interest, so much so that it was much more exciting watching it on the big screen in the press room! At this point the blinds were 20,000/40,000 with a 4,000 ante and the chip counts were as follows. Gavin Simms made a raise from the small blind and was immediately put all in by De Wolfe. Simms, pot committed, then made the correct call for all his chips with J-7 when he was getting 2/1 and was fortunate to find himself up against De Wolfe's pocket sixes. A six on the flop however meant Simms was sent packing in 4th but will be very happy to leave Ireland with €138,580 in his back pocket. With three players remaining it appeared the players made a deal which must have been very generous on De Wolfe's part as he had approximately 70% of the chips in play. The blinds were now 30,000/60,000 with a 5,000 ante. On an 8-T-Q-x board, all the chips flew in on the turn between Thorssen and Tavernier. Thorssen had flopped the nut straight with J-9, whilst David Tavernier had Q-8. The river was a cruel 8 meaning the Frenchman doubled through Thorssen. The Swede was then knocked out the next hand he played when he lost a race with A-Ts vs. De Wolfe's 7-7. It has to be said that apart from the first hand, Thorssen played a superb final table and ultimately was very unlucky to finish 3rd. There's no doubt in my mind he is going to be making many major final tables for fun in the future. Heads up 1.4 million played 2.5 million in chips with Roland still in the lead. After about a half hour of exchanges where Tavernier never really looked capable of dominating, De Wolfe finally put the last nail in the Frenchman's coffin when he filled up to trips on the turn and David moved all in on the river with a complete bluff. De Wolfe adds his first EPT title to an already very impressive resume. As I finish off this report he's standing about 10 feet away and as a poker professional who feels he has yet to prove his worth I have to say I am more than just a little bit jealous. First things first though, I have to make sure I get a glass of the champagne that Roland is kindly sharing with us in the press room! Goodbye and good luck from Dublin!